High-performance homebuilders don't just claim that their homes are energy-efficient; they back it up independent inspections and testing by a Home Energy Rater. For home to be truly energy efficient, its design and construction must consider local conditions. 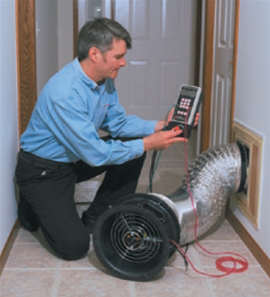 Home Energy Raters are trained in climate-specific energy savings techniques and their knowledge and field experience help homebuilders select the most appropriate energy-efficient features. 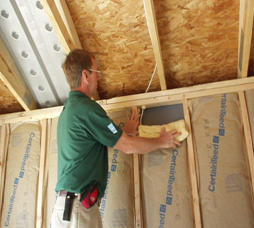 Raters conduct onsite inspections and testing of high-performance homes to ensure they meet rigorous program guidelines. 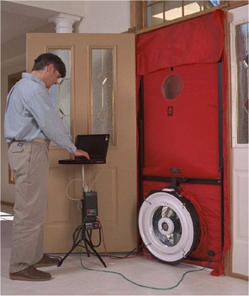 The process typically includes a blower door test to measure air leakage in the house, a duct blaster test to measure duct leakage, and a comprehensive set of inspections to assure proper construction details. Homes that earn the ENERGY STAR label typically undergo significantly more systems engineering, inspection, and testing than homes built to code. This verification process helps to identify and correct mistakes before they become problems and holds homebuilders and contractors accountable to higher standards. Download an EPA fact sheet on third-party verification. Benefits of Independent, Third-Party Inspections and Testing: HERS (Home Enegy Rating Systems) qualified Raters and inspectors must master advanced concepts in building science, pass a national exam, maintain their knowledge through continuing education, and demonstrate proficiency in their skills to the satisfaction of accredited oversight Providers. All this means that you can be confident the features used are designed and installed properly, according to manufacturer’s guidelines, and that the performance of the home is well verified through rigorous nationally approved testing methodologies.